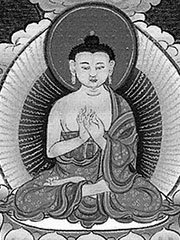 Garab Dorje (Sanskrit name: Prahevajra) was the semi-historical first human teacher of the Dzogchen or Great Perfection teachings. Prior to Garab Dorje, the Dzogchen teachings had been expounded only in celestial realms of the Buddhas and Devas. Born in the land of Uddiyana, also the birthplace of Padmasambhava, Garab Dorje is said to have received all the tantras, scriptures and oral instructions of Dzogchen directly from Vajrasattva and Vajrapani. Garab Dorje transmitted the teachings to Manjushrimitra, who was regarded as his chief disciple. Padmasambhava is also known to have received the transmission of the Dzogchen tantras directly from Garab Dorje.